You may have noticed that, seemingly out of nowhere, I have been talking about cryptocurrencies as of late. Have I caught on the masses when the value of Bitcoin jumped from 3 digits to 5 digits against the US dollar back around November/December? In a way, yes. You see, I'm not new to Bitcoin. I've known about it as far back as 2010 where anyone could mine with just a laptop CPU. I've minned quite a bit myself, spread across multiple PCs for the same mining pool. Did try solo mining, but that didn't work. Don't recall how much I have mined, but it was less than 1BTC total. As mentioned in my last post, the links to the e-book versions (epub, mobi, PDF) of the stories I post here were broken as Dropbox (where the files are hosted) has changed how publicly-shared files work. I have since fixed this issue. I'm aware that the files of the restored links are dated 2014/2015, but since no new modifications were made, those are still considered the latest version. I have also updated Getting Around Tokyo page to include additional infomation on using Suica with an iPhone that was launced recently that may appeal to you guys who may want to carry less cards, or want to use less cash. P.S. You can do the card transfer outside Japan. The last thing that I have yet to update is the FAQ page. I've ran out of time after updating the other stuff. Not sure what I'll update there, but that section about my PC specs is certainly out of date. These days, I spent more of my time on twitter, so this blog has been neglected. But as the link to this blog is the most prominent thing, the increasingly dated blog layout has been bothering me. I've updated my blog to the new layout. What elements on the interwebs has affected this blog since then? How public links on Dropbox/OneDrive work: Public folders has discontinued and has become a regular folder. Instead, a specific file/folder has to be specified to share publicly. That means links to my stories in e-book format may not work.Photobucket disallowing off-site linking: You may have heard of this one. It is still technically possible, but that requires upgrading the account to a certain paid tier. People find that even the lowest tier that allows this can be too much. What about the links to my other blogs? Well, those have been more neglected than this one. 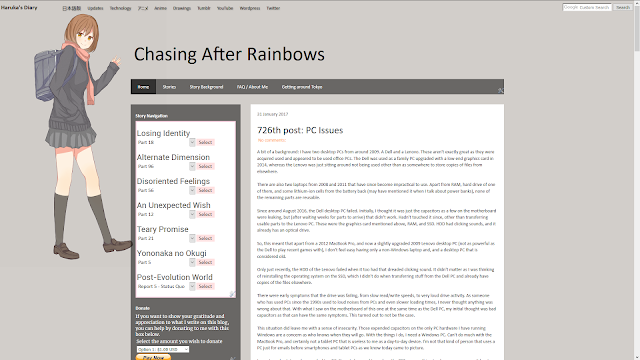 So those has to go as part of improving the blog layout. Seriously, it's too much to manage on my own. A bit of a background: I have two desktop PCs from around 2009. A Dell and a Lenovo. These aren't exactly great as they were acquired used and appeared to be used office PCs. The Dell was used as a family PC upgraded with a low-end graphics card in 2014, whereas the Lenovo was just sitting around not being used other than as somewhere to store copies of files from elsewhere. There are also two laptops from 2008 and 2011 that have since become impractical to use. Apart from RAM, hard drive of one of them, and some lithium-ion cells from the battery back (may have mentioned it when I talk about power banks), none of the remaining parts are reusable. Just bought another power bank case without cells as replacement of my oldest power bank with 4 cells, but the next oldest that is still working (2 cells) has proven to be more annoying to use these days. I have opened it up before and know it uses two li-ion 18650 cells. The same cells used in laptops with removable battery and Tesla cars. Part of the case comes off on removing charging cable on the USB micro-B end. On output end (USB standard-A), some plugs are either too loose or huge to fit it in properly without a pass through device like a USB charge doctor, which in itself adds to the bulk and consumes more power. I thought its "discreet charge indicators" was neat, but proved annoying to tell if charging when looking at the opposite side. The wordings on it has faded away, so you can't tell which side the indicators are at as the design looks similar on both ends. I live in a small town, built around a large round lake. The people here know each other well. Perhaps too well that most know me by name. This town really has nothing in terms of leisure. I was kind of surprised when a classmate told me about bringing me to a coffee shop. To my dismay, it was just a vending machine at a bus stop. As for traditions, it's tough. I don't want to do it, but I'm expected to due to my family line. Dad is the mayor of this small boring town, so the stress is even higher for those who recognized me as the mayor's child. AH! I WANT TO MOVE OUT OF THIS PLACE!